The feature of an electric round saw and How to use. It is very convenient when the hive is made or there is a rim saw (circular saw) to do Sunday carpentry with DIY. Sharpness is different, and an electric rim saw is still convenient to process it in large quantities though it is possible never to never do even with a manual saw. What is an electric round saw? An electric round saw is the one to cut the material at high speed in the one that the power of the saw was made electric. Because saw blade rotates at high speed, an electric round saw is a risky tool. When the usage is bad, the finger might be cut. It is the one to be used with scrupulous care. As for an electric round saw, the speed of cutting is more different than that of a manual saw. The accuracy of cutting is also different. It is a power tool because it can do good work of efficiency very useful for Sunday carpentry. saw blade rotates when the trigger of the switch of an electric round saw is pulled. The base is made to stick to the cut material, and the main body of the rim saw is pushed out and it cuts it. Each part of the rim saw is adjusted according to the manual beforehand. The amount in which saw blade is put out is put into the state that divisor mm saw blade has gone out under of section members. When the blade is put out too much, it is dangerous. Note following respects to work safely. To prevent it from being rolled in the rotation part of the rim saw, gloves such as cotton work gloves do not wear it. Clothes make to the one that the sleeve shut scrupulously, and prevent the button forgetting the button from being. How to use of the parallel ruler. The parallel ruler is used to cut a long material into constant width. The parallel ruler can cut the material easily and early by constant width. However, the accuracy of finish is not so good in an easy parallel ruler. It is convenient to use the guide treatment device for an electric round saw for a good cutting accuracy. 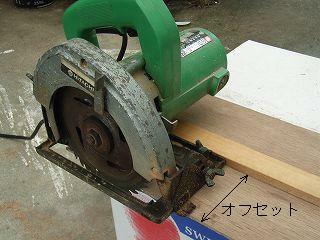 It is a photograph of the guide treatment device for the rim saw that this photograph produced with DIY. The entire length was made from about 700mm. The material is plywood of the wood of about 700mm in length and 30mm in width and 12mm in thickness, about 50mm in length, and 230mm in width and 5mm in thickness. The one twice or more the width plus of the board at the center and the width of the offset is necessary for the width of the plywood board. Because the offset of the circular saw that I was using was about 90mm, the entire width became about 210mm. To cut the straight line wood with a guide treatment device for the rim saw, the line is drawn at the board of the tree to be cut by first using instigation etc. with the pencil etc.The position that the guide treatment device for the rim saw made in this line this time cuts is applied. At this time, the line cuts and disappears when applying it like seeing the line. In a word, it becomes cutting too much. The rim saw guide treatment device is taken to the position in which the line just disappears wanting leave this line completely. If this rim saw guide treatment device is used, using the rim saw becomes happy. It becomes impossible to use the rim saw because it is scary if this is not. It is the one convenient like it. I think that you in particular do not need to buy the disc saw of quality articles if you make a disc saw guide etc. yourself. There are various kinds also in the parallel ruler and angle regulation mechanism of an option. It should think that you are easy-to-use, and you should choose what has good accuracy.